There are only three days left for you to help ISC take advantage of an incredible opportunity! A generous donor has offered to match every gift Ithaca Shakespeare receives, dollar for dollar, until the end of 2015. That means if you give a gift to ISC before the end of the year, it will help us twice as much! This is a great opportunity for ISC that might never come along again. We're working hard to expand our performance schedule, offer more educational programming, and continue improving the quality of our productions, but we're still a long way from reaching the funding levels we need to do these things. This matching offer might be our best chance to reach our financial goals and bring you a stunning 2016 season. But we are entirely dependent on you to make it happen! If you've already made a donation to this campaign, thank you! If you haven't, please consider making a gift before the end of the year. There will never be a better opportunity to help support Shakespeare in Ithaca — but without your help, this incredibly generous offer will go to waste. 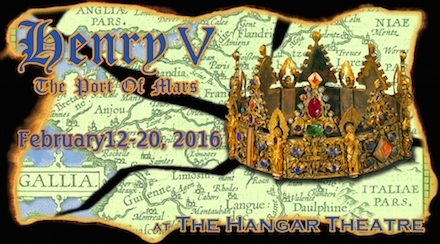 Tickets for Henry V are being sold through the Hangar box office, and this year you can reserve specific seats! Buy online here, or call the Hangar box office at 607-273-ARTS (2787). Following his father's dying advice, the newly crowned Henry V leads his country to war in France, wrestling with the responsibilities of kingship while he attempts to mould his forces into a true band of brothers...before they must face a much stronger enemy at the battle of Agincourt. 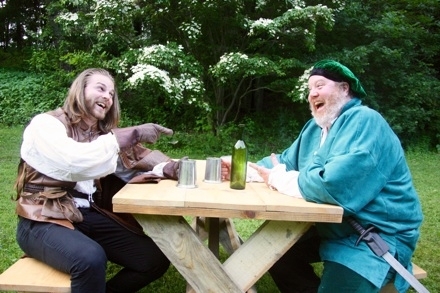 Don't miss the thrilling, thought-provoking, funny-tragic-romantic conclusion to the story of Prince Hal and Falstaff!